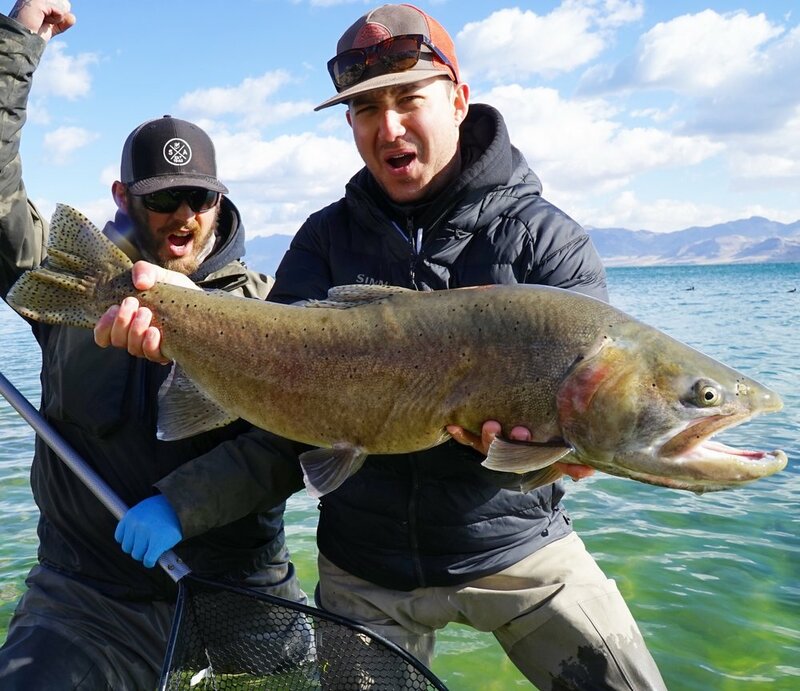 The Transition Period - 2/19/2018 — Pyramid Fly Co.
We can finally say with confidence that the bite is starting to pick up and big fish are rolling in. We had great week for big fish! Is it a red-hot bite? Honestly, not quite, but it has been substantially better than months prior. We are seeing more and more fish in shallow water and large fish are being caught throughout the day instead of only specific times, which is also a good sign. This time of year will be extremely weather specific. The large schools of fish are not far off the shore but they are coming into the shallows during low light, storms and oddly enough on the warmest of days. The cutthroat are just waiting for the water to warm up a few degrees to really charge the shallows. On the warm sunny days, the fish will be picky but they will be around enjoying the warmth of the shallow water. Most won't be visible yet or in high number like March and April but know they aren't far off. You may see rises out of casting distance but know at some point that the schools will come feed in the shallows and you must be in the water when it happens. As we see the water temp rise we will notice the shore bite increase. Guides Casey Anderson and Chris Nicola netted 5 fish over the 10.5 lb. mark and over half a dozen between the 8-10 pound range in the last week. Another indication that the fish are moving in is the coloration of some of the male "pyramid" or "summit" strain being caught. Brightly colored fish are being caught all over different beaches. The tactics have not changed much in the last couple weeks as most of the fish are still a little deeper unless the conditions are as we discussed prior. Morning and Evening bites have still been consistent. The flies you will want to have in your arsenal include: popcorn beetles and boobies in white, black, chartreuse, red/pink and combos of those colors. The trailing fly has been less specific as all bait fish streamers, clousers, wooly buggers and wooly worms etc. all have been doing very well in the same colors as the beetles and boobies but use opposite colors when using the pair for higher contrast between flies. Floating line wise with or without an indicator has been picking up but the fish on some occasions have been pretty picky. Midges and nymphs have been working just as well as balanced leeches for us, especially as the water starts to warm and we have been getting more weather and wind and can expect more this week to stir up the shallows. Successful colors for anything hanging is black, olive, grey for leeches and red, wine, black. Don't be afraid to vary depths or retrieve speed as well. This week could be promising with the weather and storms pushing in but be prepared because it will be substantially colder than we have been all month. Stay warm out there and we hope to see you out there! Hope to see you at the lake soon!